When China opened its doors to the West in the late 1970s, Western businesses jumped at the chance to sell their products to the most populous nation in the world. Boardrooms everywhere buzzed with excitement?a Coke for every citizen, a television for every family, a personal computer for every office. At no other time have the institutions of Western capitalism tried to do business with a communist state to the extent that they did in China under Deng Xiaoping. 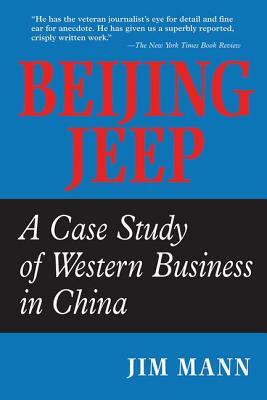 Yet, over the decade leading up to the bloody events in and around Tiananmen Square, that experiment produced growing disappointment on both sides, and a vision of capturing the world's largest market faded.Picked as one of Fortune Magazine's "75 Smartest Books We Know," this updated version of Beijing Jeep, traces the history of the stormy romance between American business and Chinese communism through the experiences of American Motors and its operation in China, Beijing Jeep, a closely watched joint venture often visited by American politicians and Chinese leaders. Jim Mann explains how some of the world's savviest executives completely misjudged the business climate and recounts how the Chinese, who acquired valuable new technology at virtually no expense to themselves, ultimately outcapitalized the capitalists. And, in a new epilogue, Mann revisits and updates the events which constituted the main issues of the first edition.Elegantly written, brilliantly reported, Beijing Jeep is a cautionary tale about the West's age-old quest to do business in the Middle Kingdom. Jim Mann served as the Beijing bureau chief for the Los Angeles Times from 1984 to 1987, then returned to China in 1989 to cover the democracy uprising. He now works as a Foreign Affairs columnist and State Department correspondent for the paper's Washington bureau.